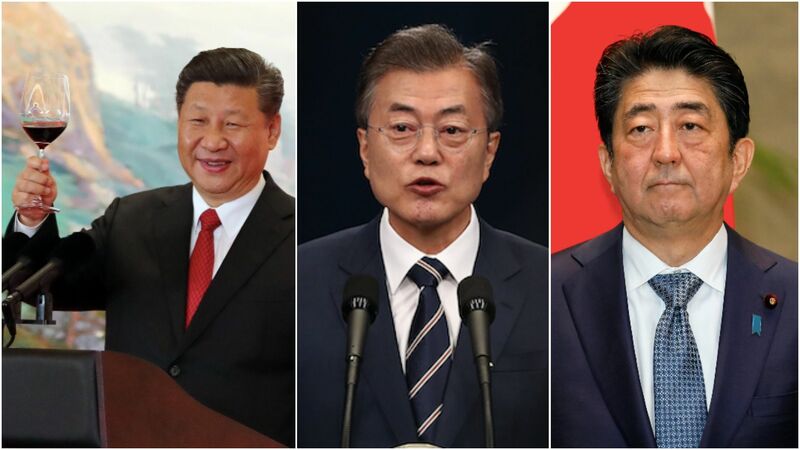 China and North Korea are the clear winners from the Trump-Kim summit, while U.S. allies South Korea and Japan emerged the losers. Why it matters: Experts are concerned that the terms of President Trump and North Korean leader Kim Jong-un’s Singapore agreement help U.S. adversaries and hurt allies. No more U.S.-South Korea joint military exercises right on China's shores. China has long wanted a smaller U.S. military presence in its neighborhood, but the U.S. continues to maintain strong security ties with both Japan and South Korea. Trump's biggest concession to Kim in Singapore was calling for an end to joint exercises, which he dubbed "war games." No clear process for denuclearization. China's power to sanction North Korea is a key bargaining chip amid its trade fight with the U.S., and Beijing was nervous to see a bilateral meeting with Kim and Trump, fearing that China would be sidelined in a denuclearization deal. But no framework for the process emerged from the summit, so China is likely to call for multilateral negotiations and ask for a seat at the table, says Chris Johnson, the China Chair at the Center for Strategic and International Studies. What they're saying: "China long ago advocated for the very same points reached during the summit," China's state-run news agency, Xinhua, wrote of the summit. Trump called for ceasing joint exercises with no apparent warning to the South Koreans. South Korea's security ties to the U.S. are also a key domestic issue in the country. "If the South Korean public perceives a lessening of the U.S. security commitment to South Korea, they will become alarmed," says Dan Sneider, an expert on the Koreas and Japan at Stanford. It could be a tough political issue for South Korean politicians as they head into local elections this year. Yes, but: The progressive wing of South Korea's government, which includes Moon, have been wanting to see an end to the military exercises, Sneider says. Be smart: One win for South Korea is the fact that their role in negotiations with the North was preserved. The U.S.-North Korea peace document specifically mentioned Moon and Kim's April agreement in one of its four pillars. No mention of Japanese abductees in North Korea during the summit. In each of his meetings with Trump — and likely during their most recent call right before the Trump-Kim meeting — Japanese Prime Minister Shinzo Abe raised the issue of Japanese abductees in North Korea. The repatriation of the abductees — some of whom have been in North Korea for over 40 years — is an issue Abe has personally championed, Sneider says. The fact that the issue wasn't publicly raised by Trump in Singapore could hurt Abe's credibility with the Japanese public, says Sneider. U.S. military exercises with South Korea are as important to Tokyo as they are to Seoul. Japan wants to ensure its own citizens that it will maintain its security alliance with the U.S., which is especially crucial to counter China in the East China Sea.